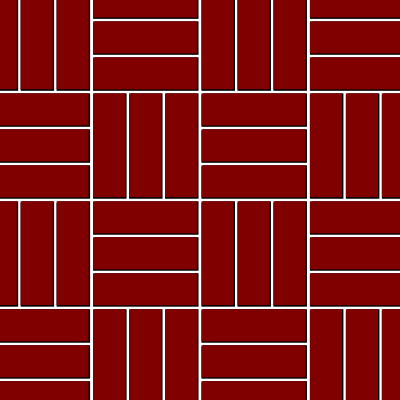 A pattern made up of pairs of bricks placed in a square grid. 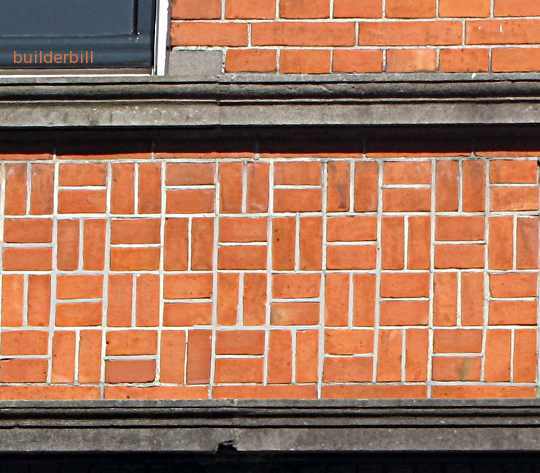 Here is a shot of a band of decorative brickwork around a building in Amsterdam. Once again, nowadays this bond is mostly used for brick paving. When it is done in walls the is a slight difference. On a close look you should notice that because of the joint, the width of the bricks are half of the joint less than half the length. In brick pavers they are exactly half. Don't be thinking that this bond is easy to lay with pavers, it is not done with standard bricks, and even when the correct bricks are used it is easy to creep and lose the straight lines that are all important for the good looks of the job. A variation of the same bond using a three to one ratio. In parquet flooring there are popular layouts that have five or six strips in the pattern. The sketch above thanks to my mates at Wikipedia.